JAMES CALLENDER. Book. Historical Memories of the United States for 1796. Jan 1797. [Philadelphia: Bioran and Madan]. 288 pp. 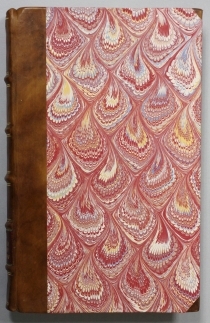 Half calf and marbled boards, bound in antique style, spine gilt, corners leather tipped. Callender (secretly backed by Jefferson) characterizes Alexander Hamilton’s push for centralized power as a moral betrayal of the Revolution. The public questioning of Hamilton’s personal finances and motivation was soon taken up again in Callender’s History of the United States for 1796, which exposed the Reynolds affair. Early in 1791, Hamilton had been called upon in Philadelphia by 23-year-old Maria Reynolds, who claimed to have been abused and abandoned by her husband. Mrs. Reynolds beseeched Treasury Secretary Hamilton for a personal favor—cash to allow her to return to New York with her small daughter. Hamilton, who had been raised by a young, single mother before being orphaned, agreed. When he called on her at home, donation at the ready, Mrs. Reynolds reportedly made it clear that she desired more than his money. Hamilton carried on the affair through 1791. On December 15, he received an urgent note from Maria informing him that her estranged husband had returned. Career swindler James Reynolds next wrote demanding hush money, threatening to expose the affair to Eliza, but promising to leave town if paid. Over the next year, Hamilton paid James Reynolds more than $1,100. In November 1792, James Reynolds was imprisoned for forgery after being caught in a scheme to purchase the pension and back-pay claims of Revolutionary War soldiers. Hamilton refused to help. Reynolds then falsely told investigators that the scheme for which he had been jailed involved Hamilton, and that Hamilton had used government funds as hush money. James Monroe and Congressman Frederick Muhlenberg investigated. Hamilton admitted to the affair but insisted that he had used his own personal funds to pay James Reynolds, turning over his letters from Maria as proof. Satisfied that Hamilton was guilty of adultery and bad judgment but not corruption, Monroe and Muhlenberg agreed to keep the affair private. 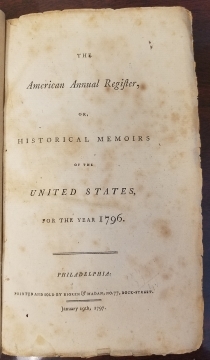 Though Jefferson supported Callender’s publication of attacks on Hamilton and John Adams, he refused Callender aid after he was arrested for seditious libel in 1800. Callender turned on Jefferson, who was then the sitting president, and became a Federalist. In 1802, Callender published the first rumors about Jefferson’s relationship with his slave mistress, Sally Hemings. Callender’s life ended unglamorously when, in a drunken stupor, he drowned in three feet of water in the James River.